MIAMI (AP) Miami Marlins All-Star catcher J.T. Realmuto was at the hospital Monday night awaiting the birth of his first child and already celebrating thanks to a big hit by his backup. Miami countered with homers by Starlin Castro and Brian Anderson on consecutive pitches in the seventh. Castro’s homer at the end of an 11-pitch at-bat against Josh Hader made it 2-all, and Anderson put Miami ahead by hitting the first pitch off the home run sculpture in center field. Milwaukee’s Travis Shaw hit a tying two-out RBI single in the eighth, ending reliever Drew Steckenrider’s streak of 20 1/3 consecutive scoreless innings. ”A golden opportunity, obviously,” Brewers manager Craig Counsell said. Aguilar’s errant throw at first base led to an unearned run for the Marlins in the fourth. He also made a lunging barehanded catch of reliever Jeremy Jeffress‘ wild toss to first on a comebacker to avert an error. Eric Thames hit a two-out triple in the third and scored on Lorenzo Cain’s single off Urena, who gave up two runs in 5 2/3 innings. Brewers players have been wearing T-shirts that read ”We believe in Jesus” to support Aguilar’s All-Star candidacy. He began the week leading the league in slugging and OPS. 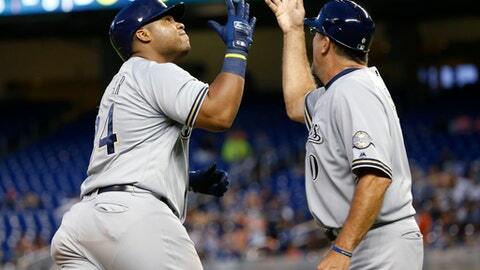 ”He has been as productive as any hitter in the National League,” Counsell said before the game. Brewers: LHP Wade Miley (right oblique strain) is expected to be activated to start Thursday at Pittsburgh. It would be his first outing since May 8 and only his third this year. … LHP Brent Suter (forearm tightness) is playing catch but isn’t expected to be activated until after the All-Star break.